Today, I'm reviewing Warner Archive's new Blu-ray edition of Silk Stockings (1957), starring Fred Astaire and Cyd Charisse. Here's what you need to know about the classic musical Silk Stockings (1957), which was just released on Blu-ray by the good folks at Warner Archive. The Stars: Fred Astaire; Cyd Charisse; Janis Paige; Wim Sonneveld; Jules Munshin; Peter Lorre, and Joseph Buloff. Source Material: The 1955 Broadway musical by Cole Porter. Plot: Film producer Steve Canfield (Astaire) wants to make a movie in Paris with famed Russian composer Peter Boroff (Sonneveld) until three bumbling Soviet appartchiks (Munshin, Lorre, and Buloff) are sent to haul Boroff back to the mother country. The men, who are seduced by the charms of Paris, fail miserably in their mission, so Moscow sends the tough as nails Comrade Ninotchka Yoschenko (Charisse) to straighten everything out. 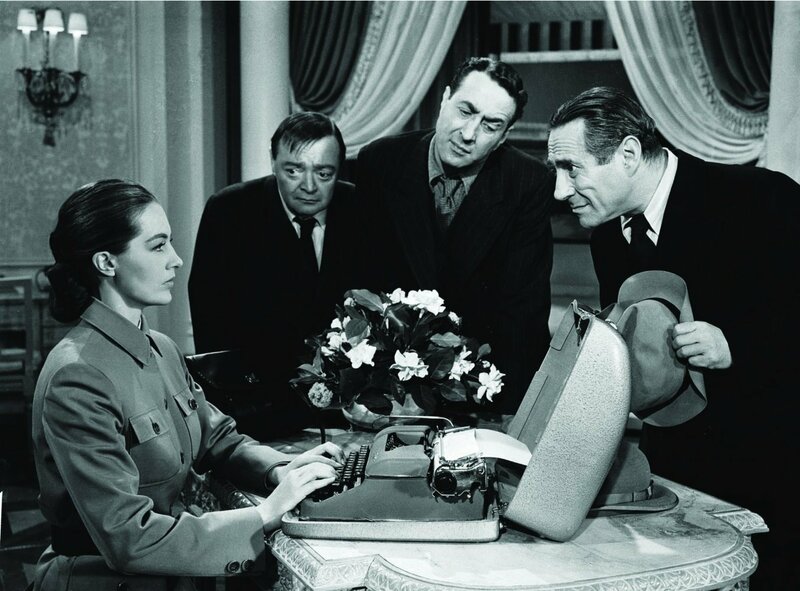 Backstory: The Broadway version of Silk Stockings, which was based on MGM's 1939 romantic comedy Ninotchka, was an unexpected smash hit, so it was no surprise that MGM producer Arthur Freed bought the rights for his independent production unit. 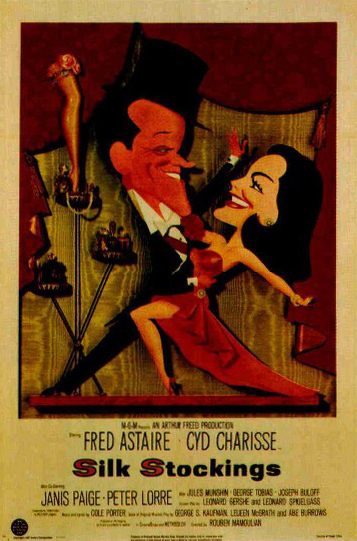 Freed re-teamed Astaire and Charisse, who had worked so well together in The Band Wagon (1953), for a film that was one of MGM's last great musicals. 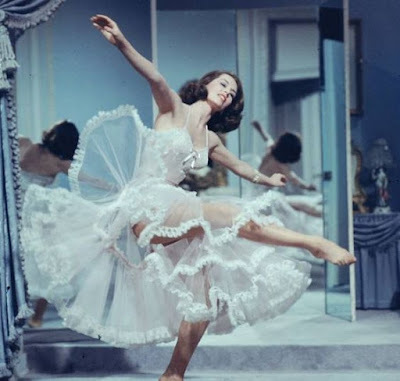 Cyd Charisse in Silk Stockings (1957). Best Performance: Charisse, who had the unenviable task of following Greta Garbo's iconic performance in Ninotchka, is wonderful in what was her favorite among her film roles. Charisse dances beautifully, of course, but she is also completely convincing as a hard-nosed Communist who is transformed by love. Honorable mention goes to Astaire, who is one of the great screen interpreters of Porter's witty lyrics, and Lorre, who steals every scene he's in with bizarre Cossack dancing. Cyd Charisse, Peter Lorre, Jules Munshin, and Joseph Buloff in Silk Stockings (1957). Best Line: "The arrangement of your features is not entirely repulsive to me." -- Ninotchka to Steve. Fun Fact: George Tobias, who plays Ninotchka's bumbling boss in Silk Stockings, had a bit part in the 1939 film. The Critics: Silk Stockings has an 100 percent fresh audience rating on Rotten Tomatoes and Leonard Maltin writes that "words, music, dance blend perfectly" in a three star review for his Classic Movie Guide. 1. Stereophonic Sound. Astaire and Janis Paige, who plays a movie star loosely based on Esther Williams, satirize fifties Hollywood's reliance on gimmicks like "Technicolor, Cinemascope, and Stereophonic Sound" to attract audiences. 2. Siberia. Buloff, Munshin, and Lorre lament their future fate in Russia with this comic number (only Cole Porter could get a laugh off of Gulag jokes). Musicals veteran Munshin is doing most of the heavy lifting here, but it's hard to look anywhere but at Lorre, whose awkward dance moves are oddly mesmerizing. 3. Fated to be Mated. 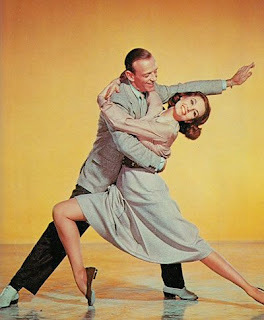 Astaire and Charisse glide gracefully across the screen in this beautiful number that Porter wrote especially for the film. Availability: Silk Stockings is available on Blu-ray from Warner Archive (link below). It is also available on DVD and video on demand.